This blind pencam shot of Joey’s Diner in Amherst, NH is my belated submission for last Friday’s Photo Friday theme of Retro. I love to sit and write in diners, and I also love to take blind pencam shots there. I pass this 50s-style diner every time I drive to Nashua, NH to meet my friend A (not her real initial) for beer & burritos, so earlier this month when I had some extra time on my way to see imbibe margaritas & appetizers with Leslee in Salem, MA, I stopped by Joey’s to see what the inside looks like. As it turns out, Joey’s piped-in music (50s classics, of course) is too loud to encourage serious thought…but otherwise it’s the type of clean, well-lighted place that makes for good writing. The next time I go there, I’ll bring earplugs, and I’ll order an old-fashioned chocolate milkshake. How retro is that? Is this restaurant on 101A? I ate there when it was called “The Timeless Diner”. I had the same complaint with the music. Derry has a similar restaurant downtown, called MaryAnne’s. Similar decor and music, just not as loud. Of course there’s the “Moonbeam Cafe” in Gorham. Not a better breakfast anywhere in my opinion. I’m glad you like the photo, Sonia. I love all the shiny surfaces! I find *lots* of restaurants play their music far too loud, which causes everyone to SHOUT to be heard. It’s really obnoxious, actually: what happened to having a conversation over dinner? Pencam? Are you a spy? Love the pearlescent interior, lit by bioluminescent pearl lights on strings. Oh I LOVE the 50’s retro look, and I’ve always wanted to do my kitchen in that red and chrome look! Fabulous pictures as always Lorianne! We have similar diners here too. They are a real hoot; music too loud, as you said, but MY music, and I love it. 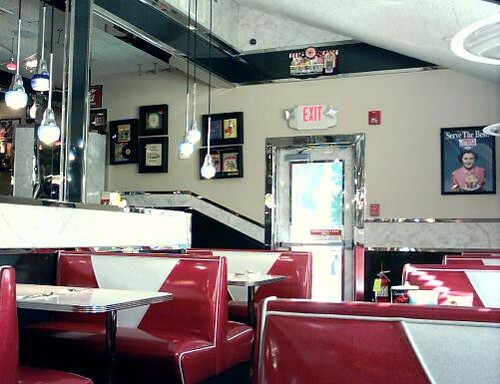 i’ve actually never been to a “retro” diner before and i’ve always wanted to try one. amherst isn’t too far from where i live, i might just go one day. btw, i really want to commend you for being out and about so often, especially with all this dreadful, incessant rain (although right now i’m in upstate ny so i’m not sure how rainy is really is up in new england). i expect lots of exciting pics from halloween! salem might be very interesting on that day (hint hint, you should go and take pics! ), probably lots of stuff going on. i wish i had the time to drive back but it takes 6hrs from where i am now. ugh. don’t you wish teleporting were real?